Graciela Borges (Spanish pronunciation: [ɡɾaˈsjela ˈβorxes]; born Graciela Noemí Zabala, June 10, 1941) is an Argentine television and film actress. Borges was born in Dolores. Having made her film debut at 14, she has acted in over fifty films and was featured in 2006 in Vogue Paris as "the great actress of Argentine cinema". 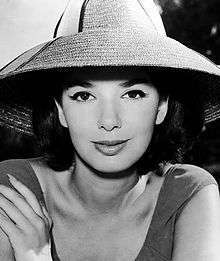 She has been working in the Argentine cinema and television since her first role in the film Zafra (Sugar Harvest) in 1958. ↑ Graciela Borges at the Internet Movie Database. ↑ Fernández Zini, Sebastián (8 November 2011). "Graciela Borges: "Ser abuela me llena de amor, luz y felicidad"". Argentine edition of ¡Hola!. hola.com.ar. Retrieved 21 February 2013. Wikimedia Commons has media related to Graciela Borges.